For those who are unfamiliar with The Violet Burning, Michael Pritzl has described their musical style as a blend of U2, the Cure, Smashing Pumpkins, Black Sabbath, and Pink Floyd. This unusual blend of influences has given The Violet Burning a unique musical style. Michael Pritzl, head man for The Violet Burning, has always been known as a prolific songwriter. Pritzl has led The Violet Burning since 1989. During the past 20 plus years, the band hasn’t strayed from it’s indie rock roots, primarily being an independent band. Now comes the Violet Burning’s ultimate endeavour, seven years in development, 34 songs on three discs, 2 hours 20 minutes long and an 80 page booklet. This is the stage Pritzl has set for The Violet Burning’s latest release, The Story of Our Lives. I know that concept albums often fail to achieve their original intent, but not in the case of The Violet Burning. 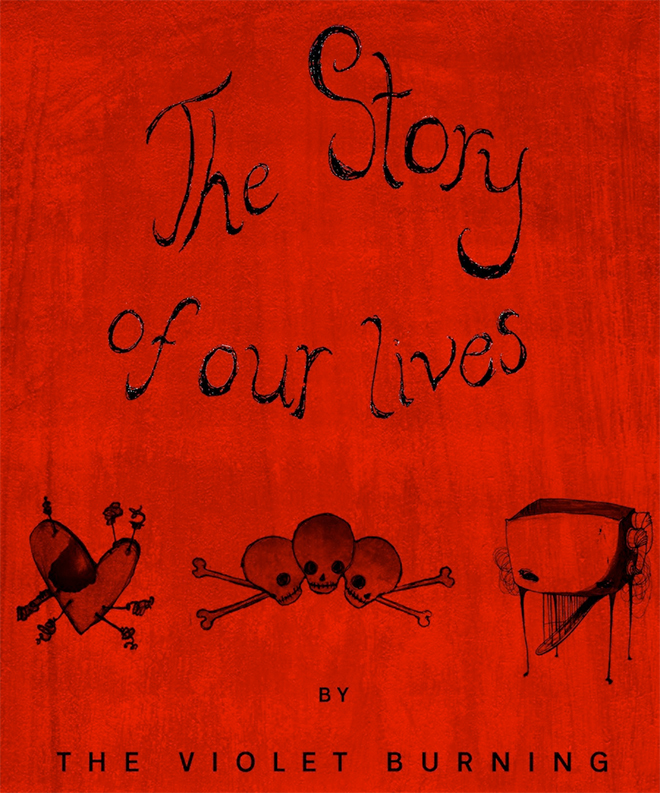 The Story of Our Lives is brilliantly conceived, written and performed. This is undoubtedly the greatest work ever produced by this critically acclaimed band. Due to the breadth of material on this album, I will only give an overview of each disc and some of the songs. Pick up this album to make your own track by track assessment. This musical experience begins with disc 1, TH3 FANTA5T1C MACH1N3. The songs give lyrical discussion to the battle between God and an Orwellian 1984ish world (the MACH1N3) for the soul of an individual. The character is trapped in this world and decides, in the course of the songs, that his only means of escape is death. “Br0ther, Part 1”. Pritzl’s vocals override a mechanical, Big Brother voice. The song lyrics make a comparison of the machine to the music industry. “TH3 FANTA5T1C MACH1N3”: sounds like it was plucked from and old Beatles album. “Leaving (But, I Don’t Wanna Leave You)”: a mournful song of longing. The melancholy final song of disc one, “Leaving (But, I Don’t Wanna Leave You)”, is left behind. Black As Death, disc two, opens with a dramatic musical shift, and a noticeable Black Sabbath influence on “My Name is Night”. Many heavier songs are found on disc two, but also some acoustic tracks. As the disc name would suggest, disc two has a dark feel. The album character, after choosing death, explores the potential consequences of his decision. The final disc brings the summation of this musical trilogy. Liebe über Alles, the title of disc three, translates as “all about love”. God’s love prevails. The album’s character, though he had chosen death, lives, and finds peace as he is reunited with God’s Spirit.